Through the college counseling department, students and parents are offered expert guidance and support in order to undergo the college admissions process of colleges and universities around the world but with special emphasis on US universities. The college counseling department formally begins orienting students in the second semester of 10th grade and continues working with them through 11th and 12th grade. The college counselor assists students in preparing for college admission and with course planning, scheduling standardized testing, writing applications, choosing colleges, responding to questions posed by both students and parents about the college application and acceptance process. The department also organizes and delivers financial aid workshops, college application workshops, writes letters of recommendation for all students and organizes College Fairs. Students are also advised on available scholarships, and assisted in writing marketable admission essays, obtaining letters of recommendation and preparing for college interviews. 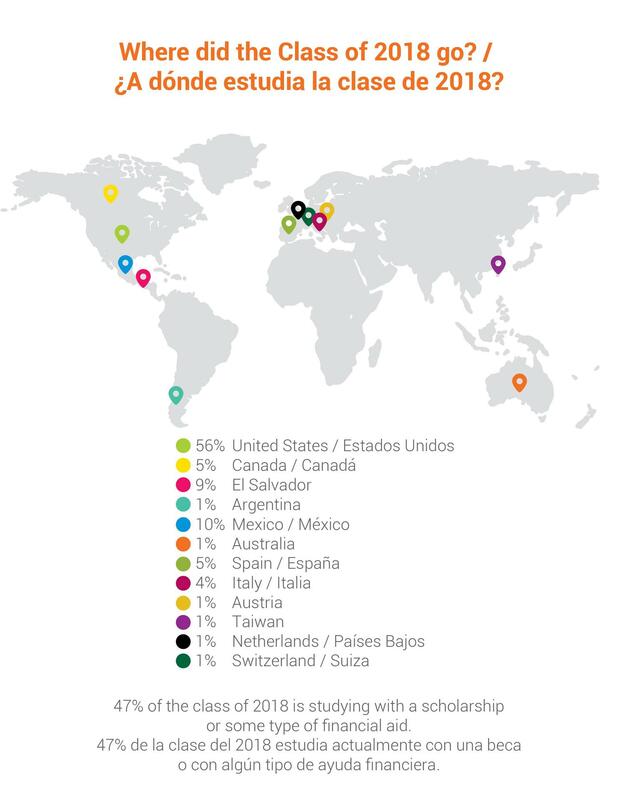 EA students are admitted to prestigious universities and colleges around the world, and are awarded financial aid and scholarships by many of top universities. Preparation for college in Upper School is the culminating task of the Counseling department. Students are invited to explore their strengths/weaknesses and career interests through Guidance lessons. There is a skill lessons on this topic that has the students explore and learn about different career options. If a student is much disoriented in regard to what they want to do we refer them to a vocational guidance testing. Preparation for college includes taking the PSAT as a 9th, 10th and 11th grader. Our students take the PSAT test 3 times and each time they receive their results they have an opportunity to review them so they can reflect on how they could improve their performance next time around. College counseling includes a parent/student evening in 11th grade where the college admissions process is presented. This talk allows parents and students to share a common language that will be necessary to move the process forward. Students are encouraged to prepare for the College Board exams and several options for doing so are outlined and emailed to the families. Individual family meetings also take place as needed, however, there are two scheduled ones: one in their junior year, another in the fall of their senior year. The objective in these meetings is to determine the basic information crucial to the college process. What does the student want to study? Where? Will financial aid be needed? With this information the counselor then suggests the exams the students will need and school he/she should be looking into. The college counselor also organizes and advertises College Fairs and College representative visits to Escuela Americana. For those students who pursue their studies in El Salvador, the counselor coordinates visits to the local universities. The counselor also organizes and delivers financial aid workshops, college application workshops and writes letters of recommendation for all students. Preparation for college is the culminating task of the Counseling Department. The primary mission of the Escuela Americana College Guidance Counselor is to offer students and their parents professional guidance, information, feedback and support in order to navigate the college admissions process at colleges and universities around the world with special emphasis on U.S. and Salvadoran institutions of higher education. Make sure you are enrolled in the appropriate college-preparatory courses for the type of college you would like to attend, and do this every year of High School. If you have questions talk with your counselor about it. Get off to a good start with your grades. The grades you earn in ninth grade will be included in your final high school GPA. Talk to your parents about planning for college expenses. Continue or begin a savings plan for college. Use the Internet to check out college Web sites. Keep your grades up so you can have the highest GPA possible. Ask your counselor about Advanced Placement (AP) courses. Keep putting money away for college. Make a list of your most important criteria in a college (size, location, distance from home, majors, academic rigor, housing, and cost). Weigh each of the factors according to their importance to you. Attend the College Counseling Junior Family Meeting second semester. Collect information about college application procedures, entrance requirements, tuition and fees, room and board costs, student activities, course offerings, faculty composition, accreditation, and financial aid. The Internet is a good way to visit colleges and obtain this information. Begin comparing the schools by the factors that you consider to be most important. Discuss you PSAT score with your counselor. Begin narrowing down your college choices. Find out if the colleges you are interested in require the SAT I, and/or SAT II Subject Tests for admission. Register for the SAT and/or ACT Assessment. Begin preparing for the tests you’ve decided to take. Have a discussion with your parents about the colleges in which you are interested. Examine financial resources, and gather information about financial aid. Consider whom you will ask to write your recommendations. Think about asking teachers who know you well and who will write positive letters about you. Letters from a coach, activity leader, or an adult who knows you well outside of school (e.g., volunteer work contact) are also valuable. If possible, over the summer visit campuses of your top-five college choices. Practice filling out college applications. Give recommendation forms to the teachers you have chosen, be sure to fill out your name, address, and school name on the top of the form. Talk to you recommendation writers about your goals and ambitions. Give School Report forms to your high school’s guidance office. Fill in your name, address, and any other required information on top. Verify with your guidance counselor the schools to which transcripts test scores, and letters are to be sent. Give your counselor any necessary forms at least two weeks before they are due or whenever your counselor’s deadline is, whichever is earlier. Register for and take the TOEFL, ACT Assessment, SAT I, or SAT II Subject Tests, as necessary. Be sure you have requested that your test scores be sent to the colleges of your choice. Fill out financial Aid Forms. Send midyear grade reports to colleges. Continue to focus on your schoolwork! Mail or send electronically any remaining applications and financial aid forms. Make sure you apply to at least one college that you know you can afford and where you know you will be accepted. Watch your mail for acceptance notifications from colleges. Make your final choice, and notify all schools of your intent by May 1. Send your nonrefundable deposit to your chosen school by May 1. Request that your guidance counselor send a final transcript to the college in June.